From mug-warming drinks to artisan creations, the holidays call for liquids to warm the body and spirit, or to keep a cool party going strong. Drinks are an inviting way to welcome guests to your home, a great way comfort those in need of a little TLC, and a warming way to self-soothe the holiday stress away. 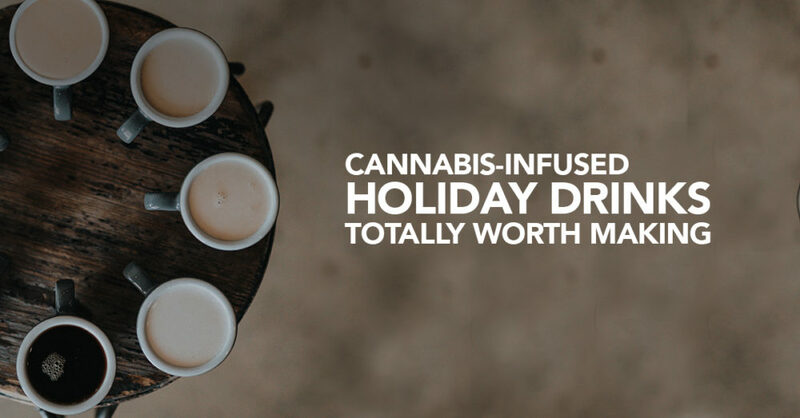 There’s no doubt about it, drinks during the holidays heal all–particularly when it comes to cannabis-infusions where healing powers are literally front and center. These are a few of our favorite holiday cannabis-infused beverages. When one thinks about fall, apple picking and mulled cider often comes to mind. That’s why this hot apple cider recipe tops the list. It’s the perfect drink to warm you up during the cooling temperatures. And the extra medicating power of cannabis is the perfect combination for a promise of relaxation in front of a roaring fire. You might want to cuddle up with a loved one for even better warming results. Traditional eggnog just got more interesting thanks to this infused recipe. Eggnog is a delicious drink that’s sweet, nutty, and creamy. Because of its thick and cloying consistency, one sips on eggnog for longer periods of time rather than slurping it down fast. This results in a mellow and slow-building buzzed feel. And with this cannabis rendition, the slow buzz is still just as gradual but now it’s even more punctuated. This vodka cocktail is the perfect solution to an upcoming holiday soiree. It’s a cocktail blend featuring floral notes with an herbal taste. Brought to you by Humboldt Distillery, the Hemp Highball recipe calls for its THC-free vodka. It’s the perfect cocktail creation to serve up to friends and family without fear of unwanted psychoactives. Guests can just sip the vodka cocktail leisurely while enjoying the herbal taste and relaxation–minus the high effect. Chai tea is a creamy, nutty, and spice-filled drink that warms hands, hearts, and spirits. It’s a wonderful holiday treat that pays homage to the season while satisfying all your tea needs. And this cannabis-infused version is even better than the original with the marijuana add-on. It’s a delicious and potent way to relax in more ways than one. If you’re anything like us, then you’ll agree coffee isn’t just a holiday treat, it’s a 365-day necessity. But with the overbooked holiday schedule and the often stuff-your-face-silly dinners, coffee during the holidays is now more important than ever. Check out this easy-to-follow recipe for cannabis coffee that will satisfy your AM wake-up needs as well as your PM post-food-coma needs equally.